Eudon Choi’s gender blending genius continued for Fall 2015. The second presentation to be held in Somerset House’s BFC Courtyard Space, Eudon commissioned a set for the runway. Red and grey brutalist architecture decked the strip of catwalk where models wore his beautiful wares. Last season I was a tad blasé by his offerings. This season, on the contrary, I was more than impressed. I was in love. The collection opened with a slew of lovely outerwear. The artistic element to the collection was notable. 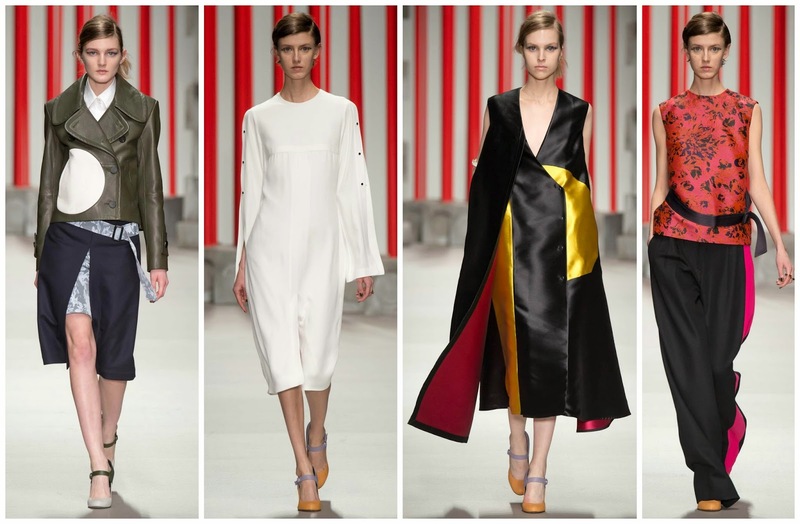 Architecturally sculptured outfits, draped looks and Japonaiserie á la Van Gogh also were shown. This collection, perhaps Eudon’s most artistically driven outing, was welcomed in open arms. The opening look a rich dark army green leather jacket featuring a white circle. Underneath a navy skirt with floral details and a buckle belt, and a simple crisp white buttoned up shirt completed the look. There was a lot going on here, but I believe it was executed perfectly. Another look that caught my eye was Look 5. White wide leg trousers, conforming with the 70’s trend of the season, was paired with a two tone (navy and floral) wool sweater with a side split and featured buttons. Orange heels rounded out the look. Things got increasingly more interesting when the Japonaiserie was shown. The satin materials shown in the penultimate segment of the presentation were in vivid hues of chartreuse and magenta (similar to Copping’s ODLR debut palette). The black tuxedo two piece of Look 24 featured a magenta hem on the blazer and on the waist of the flared ankle length trousers. The final troupe of red and black Oriental inspired outfits rounded out a great effort from Eudon. The second presentation of London Fashion Week was just as good as the first, in its own unique way. I’m going to run out of superlatives for the wealth of talent London designers are showcasing this season. Eudon Choi is at the forefront of this directional season in England’s capital, and arguably the capital of European fashion.